Harman Kardon Citation 100 review | What Hi-Fi? Harman Kardon has made some striking speakers in the past, including its transparent SoundSticks, but the era of the smart speaker demands a different approach. The company’s latest model, the Harman Kardon Citation 100, is minimalist in appearance, but while it wouldn’t look out of place in a showhome lounge, there’s a beast inside. As well being able to play extremely loud without strain, bass is unusually powerful and prominent. It is great for parties, though not so much for purists. Basic economic theory says that competition promotes innovation, however the rapid growth of smart speakers has seen their design narrow to an almost standard template. Simple fabric-covered looks are the flavour of the month. The Citation 100 doesn’t stray much from the standard design. Its wool blend fabric grilles are a little darker than most, but there are plenty of stylistic similarities between this and a Google Home Max, including the array of LEDs under the front fabric that let you know the built-in Google Assistant is listening. It is smaller than a Home Max, while its shape is closer to that of an overgrown Sonos One. Size is less of a concern here anyway, as the Harman Kardon Citation 100 isn’t portable. This is a speaker that deserves its own spot in a room, and to stay there for the rest of its useful life. The Citation has no aux input and no USB port to charge other devices. It’s one of the speaker’s key weaknesses. This is not just a digital assistant speaker, though. It also has Bluetooth, handy for streaming from apps that do not support Google Cast. The speaker is otherwise totally subsumed by the Google Home wireless system. Set-up is done via the Google Home app, which also manages its multi-room features. 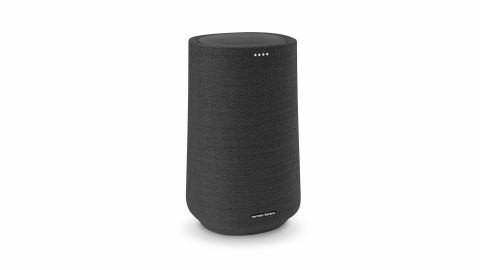 It can be grouped with other Google Home speakers. Google Assistant lives inside the Citation 100, and uses a mic array to listen out for your voice. It’s unclear how many mics there are, though – six is the norm for a smart speaker, but only two are visible here. Harman Kardon’s documentation doesn’t reveal whether there are any others hidden behind the grille. For the most part, the array works well. The Citation 100 picks up your voice at normal volume, and the mics are sensitive enough to let you speak away from the unit. However, it does seem more susceptible to cutting out with weaker wi-fi signals than most Alexa smart speakers. The Harman Kardon Citation 100 has a 20mm tweeter and a 10cm woofer, a bookshelf-speaker like array. Its main driver is partnered with a large passive radiator, which sits on the back of the cabinet. For better or for worse, bass is the Citation 100’s defining feature. The low frequencies are extremely powerful, and bass depth is excellent for a compact unit. But this speaker isn’t just for playing bass-heavy electronic music – this power also lends weight and richness to the plodding tuba of Randy Newman’s Lonely At The Top. It’s expertly applied, to the extent that the bass doesn’t bleed everywhere. But, listening to the rest of Newman’s Sail Away album we can’t help but notice bass guitar lines are far more prominent in the mix than intended. There’s deliberation to the Citation’s tuning, but it is far from neutral and provides a skewed, if sometimes entertaining, take on songs. The rest of its sound character is less dividing. Mids are rich and fairly well-textured. Treble has clarity without sharpness or sibilance. There's impressive scale to the sound too, particularly considering there are just two active drivers here, rather than a stereo array. The Citation 100 is confident at high volumes, much more so than the Sonos One. The excitable bass makes the Harman Kardon an ideal party speaker, but there’s enough refinement in the other frequencies to ensure the output isn’t entirely at odds with the grown-up design. However, we can’t help but feel this would be a better buy all-round if it had a switchable ‘turbo’ mode, which would give the option of turning on the Citation’s boosted bass when required, and also offer a more balanced alternative where the bass isn’t constantly the focus. The Harman Kardon Citation 100 has bass that is too energetic to be considered balanced, but it is otherwise a tasteful-sounding smart speaker with enough scale to fill most rooms. If you don't mind that bassy over-exuberance, there's a lot to like here.